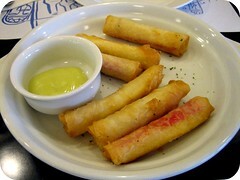 Mmmm, these Kani Cheesesticks from Windows Cafe are delicious! Each order has 6 pieces of these babies, and man, they aren’t enough for two. 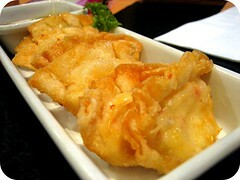 They serve this dish with a wasabi mayo dip. The spice complements the sweet tastiness of each kani cheesestick perfectly. 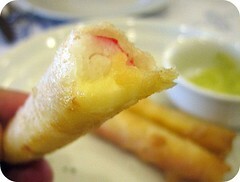 When you bite into each stick, you’ll see there’s an equal proportion of crabstick and cheese. Good thing they didn’t scrimp on either! It’s good on its own, but with the wasabi mayo, it’s even better. We tried the Windows Cafe at Robinson’s Galleria. I’ll go back there just for this appetizer! Ginger in chocolate? In a creme brulee? Well, it worked. It tasted damn good. Tasted and loved at M Cafe. Have you taken the LRT recently? Well – we all should…if only to wax poetic during the ride. The Instituto Cervantes de Manila, led by Director Jose Rodriguez, and the Light Rail Transit Authority have collaborated to install posters inside the carriages of LRT – all of which contain celebrated Spanish-language poems by such writers as national hero Jose Rizal, Jesús Balmori, Claro M. Recto, José Palma, and Fernando Maria Guerrero; Spanish poets Calderón de la Barca, Lope de Vega, García Lorca, Antonio Machado, Luis Cernuda, Luis Rosales, Miguel Hernández and Gil de Biedma; and Latin American writers Pablo Neruda and César Vallejo. The poems, of course, have Filipino translations (so we can stop ogling at strangers and start memorizing some fine verse). This new promotional campaign, entitled “Verse in the Metro”, was launched recently to encourage reading among Filipino commuters, as well as to strengthen the ties between Spain and the Philippines, two countries that share a common past that spanned more than 300 years. “With almost one million commuters riding the train every day, it provides a great opportunity for the reading campaign to reach as many people as possible,” Rodriguez (rightmost in the photo) said. Instituto Cervantes is the cultural arm of the Spanish government that promotes and teaches the Spanish language and culture. It is the largest Spanish teaching organization worldwide, with more than 70 centers in 4 continents. With its collection of classic and contemporary Spanish Institute, movies and music, the Instituto library has become an important agent in promoting the Spanish language in the Philippines and is an indispensable source for those who are interested in Spanish and Latin American cultures. Change pervades the world of the Filipino, and it has become, so to speak, a norm of life. It dictates the lives of our people. As such, Filipinos have been – for a lack of a better term – forced to go with it or be left behind. Eat or be eaten. Hunt or be hunted. Such kind of life has, in turn, spawned an attitude of ‘what-you-can-do-I-can-do-better’, and conceived a behavioral exercise which may best be described as one-upsmanship. Indeed, Filipinos have always aspired to be at the head of the game. But fads come and go, fashions roll through and past, and today’s trends will eventually dissipate into yesterday. Very few transcend the realm of vogue and, in the minds and hearts of Filipinos, even fewer enter the rare air of tradition. At first glance, basketball and beer seem to have little connection. Maybe none at all. The first is a sport involving the fundamentally physical activity of putting inflated orange balls in a hoop despite a host of defenders. The other is an alcoholic beverage best enjoyed chilled, with a group of friends, in pursuit of relaxation. The disparity may seem obvious, but in confronting this seemingly stark contradiction, one will realize that basketball and beer are uniquely intertwined. I was going to my office building one morning when I noticed a group of people milling around near the building’s entrance. I got curious what could it be that they were so all agog about. So there’s a man selling taho (soy bean curd) to everyone’s delight. Taho vendors are everywhere. They go around different neighborhoods, in school vicinities. You can even spot them in major highways, some even ride public utility vehicles with their huge taho buckets in tow. 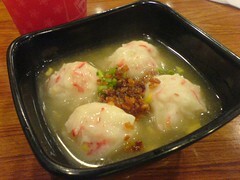 They have this distinct tone of voice letting people know they have arrived, “taho! taho!”. Can you miss that? And now I see them in central business districts. 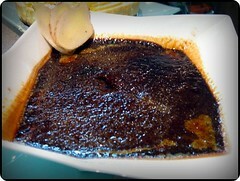 Taho had been reinvented by selling them in different flavors in specialty restaurants. The flavor is not anymore confined to plain soy bean. There are tahos that come in capuccino, chocolate and even strawberry flavors. Have a cup when you encounter your friendly neighborhood taho vendor.